I began my health and fitness journey in July 2013 and reached my goal of losing over 100 pounds in August 2015. 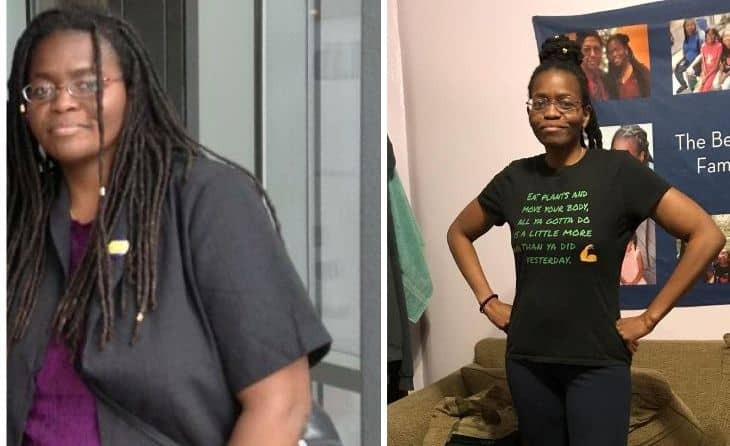 A few years prior, I had lost over 20 pounds by cutting out sodas, juices, and milk, but I had not yet made a big change. 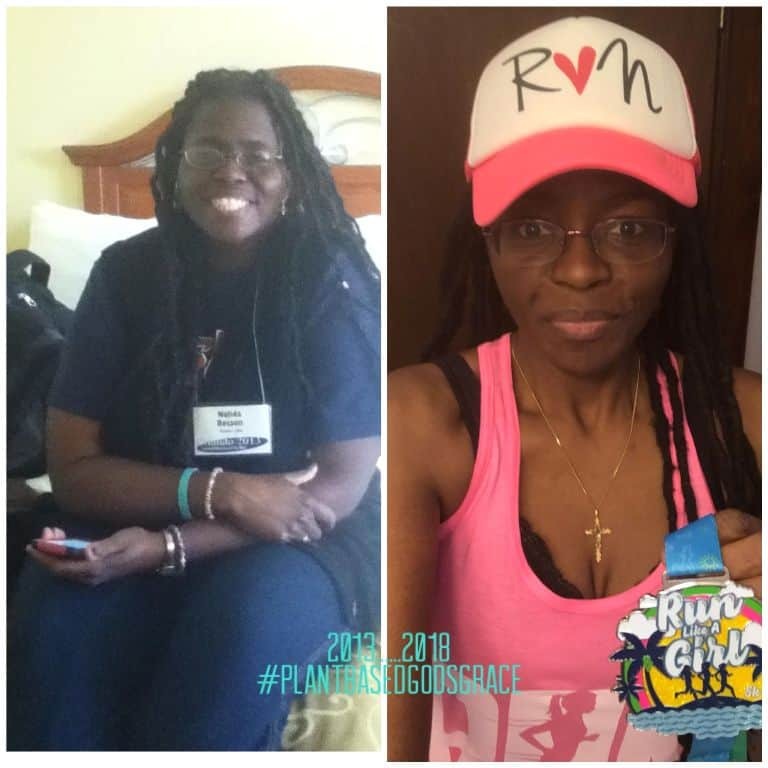 Beginning in July 2013, I lost the weight and became healthier by adopting a nutrient-rich whole food plant based diet and by incorporating running, walking and strength training as part of my lifestyle. I went from a size 24 to a size 6. Prior to changing my lifestyle, I suffered from chronic pain in my entire body–joints, muscles, gallbladder attacks, even my skin hurt, and was afraid I wouldn’t be around for my family. I have three children who are legally blind. It is hereditary from my husband who is also legally blind from congenital cataracts and microphthalmia. Two of my children also have autism as well as developmental and intellectual disabilities. I didn’t want to die prematurely and leave my kids without a mother. One day in July 2013, while in a lot of pain, I looked into my six-year-old son’s face and knew I needed to make a change. I prayed for a change, and after my prayer I noticed the book Eat To Live on my nightstand where it had sat largely unread for over a year. 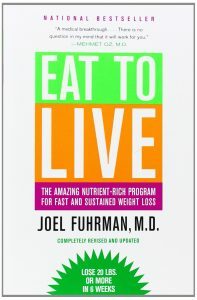 Eat to Live by Dr. Joel Fuhrman. Available on amazon. Click to view book. Affiliate link. I had a moment of epiphany and knew this was the answer to my prayer. That is what launched my journey. After reading Dr. Joel Fuhrman’s book, Eat To Live, I went from a junk food vegetarian to a healthy plant based eater. With my husband’s blessing, I threw out all of the junk food (cookies, chips, sugar, oils, salt, etc.) and replaced them with fruit baskets, veggies, and raw nuts and seeds. All of our taste buds adapted. I learned more from other plant based experts and films too, including Forks Over Knives, Chef AJ, Cathy Fischer, and many more in our journey. I also learned from other experts such as Dr. Judith Beck, Dr. Rhona Epstein, and Barb Raveling on mindset changes, cognitive behavior therapy, and spiritual therapy to achieve and sustain weight release. From the beginning, I incorporated movement into my days. Initially, I could barely walk fast, never mind run. I struggled to do walk DVDs in my living room. But as I began to lose weight and get stronger, I felt that I could do more so I started running on the treadmill about a year later. I would run and post videos on my Facebook page Plant-Based God’s Grace with the hashtag #TreadmillMom. Because of a past herniated disc and having two slight spine curvatures as well as a hip injury, I was hesitant to run outdoors because of the impact. But during the summer of 2017, I felt strong enough to run outdoors and I started running–literally in circles–in my small paved backyard. Treadmill Mom became #BackyardRunner! I ran to train for 5Ks around disability issues, for vigorous exercise to help keep me trim, and to combat the inevitable winter blues. I also started to run with my younger daughter who is legally blind with low vision and also the most impacted by autism and intellectual impairment. We found that when she walked briskly and ran, she was less frustrated and better regulated. In October 14, 2017, we ran our first outdoor 5K. I had done virtual ones before with the Play Brigade 5k for Inclusion for runners of all abilities and disabilities. We also ran the Best Buddies International 5K for those with intellectual and developmental disabilities in November 2017 and since then have run several more races. My children and husband basically adopted how I ate since I primarily shop and cook. My husband, Michael, however, remained pescatarian and ate seafood as well as oily and salty foods outside the home. He had been an omnivore prior to our meeting and marrying but had lost over 200 pounds. Previously, he had been around 500 pounds, and was able to lose weight by cutting out most meat. He had gone from a 54 inch waist to a 44. However, he was still obese and suffered from high blood pressure. Before he became 100% WFPB (whole food plant based), his blood pressure at a doctor’s visit was 185/111. In May 2017, I was being filmed for Jason Cohen’s upcoming plant-based documentary, Big Change The Film. I agreed to be in the film, because I wanted to be able to help people see that it was entirely possible to make a big, lasting change. During filming ,Tim and Heather Kaufman who are also part of the film visited us. My husband was inspired to make a big change himself after the filming and meeting some of the people in the film, and I’m forever grateful that the film helped him first, even before its release. 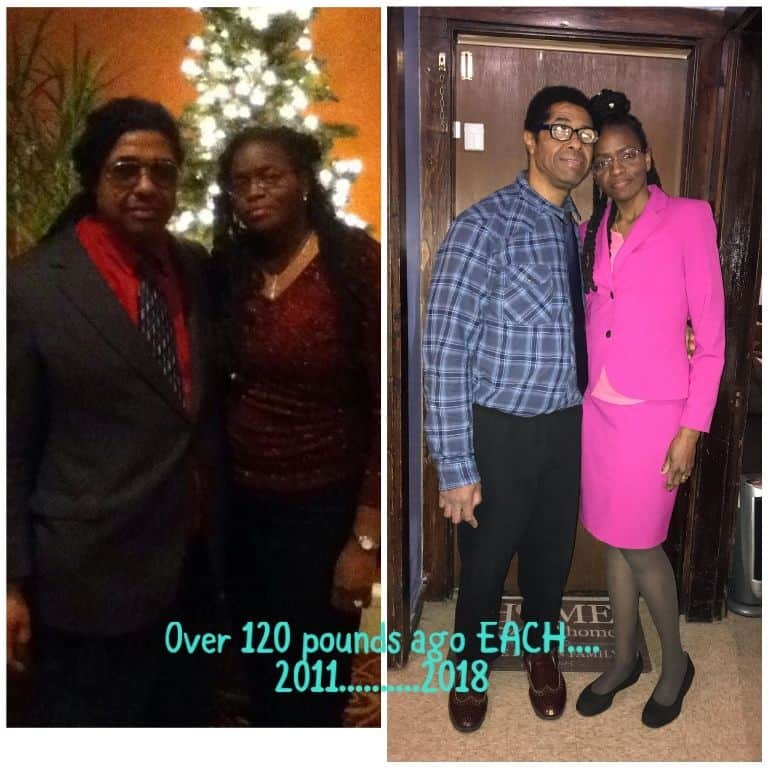 Michael Besson’s weight loss journey. 500 lbs to 250 lbs to 180 lbs. That summer of 2017, we went to New Jersey and attended a whole-day seminar on high blood pressure with Dr. Fuhrman. We also visited with a friend Anthony Masiello and his family. Anthony had been featured in Dr. Fuhrman’s book and had himself released excess weight and lost his high blood pressure. That further strengthened Michael’s resolve. 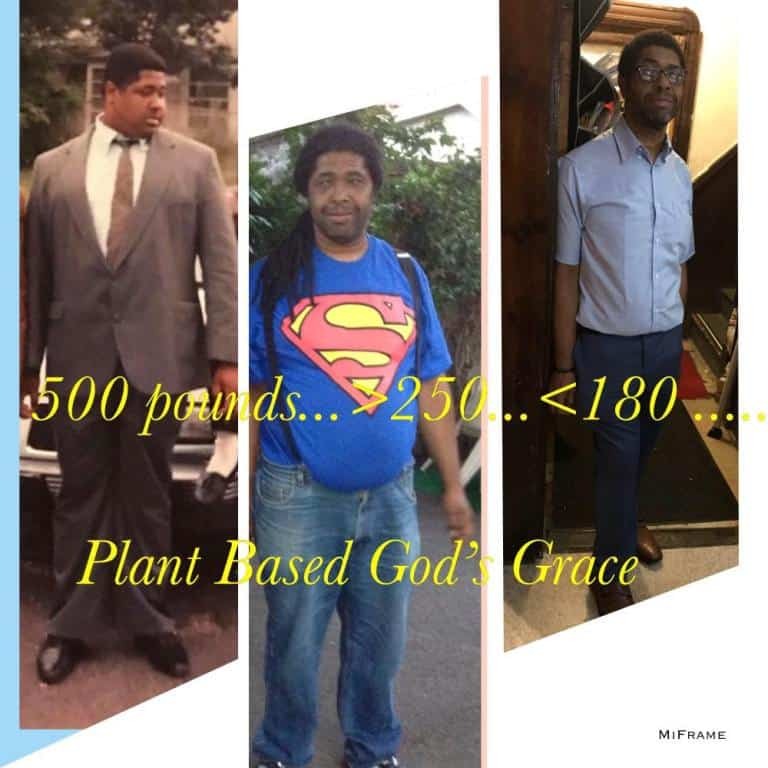 He lost over another 120 pounds, went down to a size 34 waist pants and men’s medium, got off his high blood pressure medication, and is now training to run the 2019 Boston Marathon with two sighted guides for The Play Brigade, the organization whose 5K we had run and who works towards inclusion in recreation, play and sports for people with disabilities. 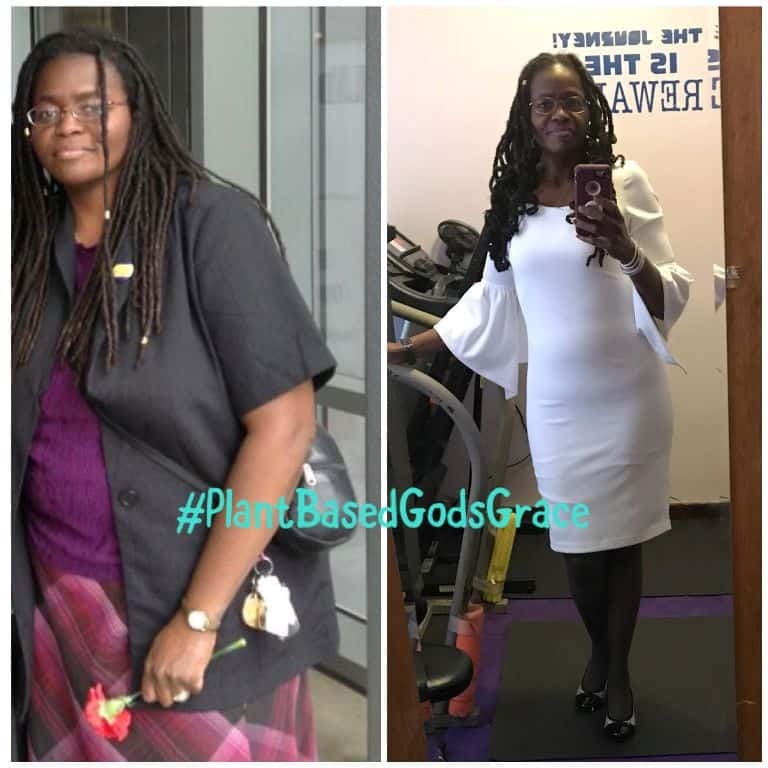 I feel my journey is as much a spiritual journey as a physical one and that my faith has helped with the mindset changes needed for a positive physical transformation that has helped with sustained weight loss and health. Michael and Nalida Besson loose 240 lbs combined. I no longer desire to eat poison junk foods or to overfeed my body as I believe it’s the temple of the Holy Spirit, and I no longer want to abuse it with overeating. My family feels the same way and we work on renewing that resolve daily on this ongoing journey. 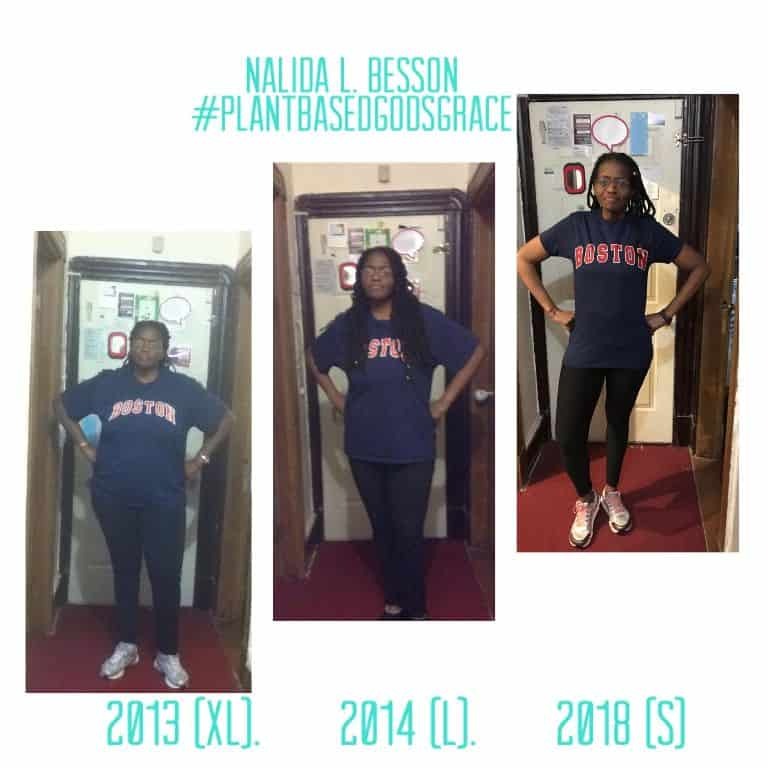 To follow Nalida, go to her website, Plant-Based God’s Grace or her Facebook page, Plant-Based, God’s Grace: Nalida’s Journey to Health and Fitness. Amazing story. Thank you for sharing your strength and determination to heal yourself and your family. You’re a beautiful person..